As wattages increase in high-density server racks, providing redundant power becomes more challenging and costly. Traditionally, the most practical solution for distributing redundant power in 208V server racks above 5 kW has been to connect dual 3-phase rack PDUs to dual power supplies in each server. Although this approach is reliable, it negates a rewarding system design opportunity for clustered server applications. With their inherent resilience and automated failover, high availability server clusters will still operate reliably with a single power supply in each server instead of dual power supplies. This streamlined system design promises to reduce both capital expenditures and operating costs, potentially saving thousands of dollars per rack. The problem is that dual rack PDUs can’t distribute redundant power to a single power supply. An alternative approach is to replace the dual PDUs with an automatic transfer switch (ATS) connected to a single PDU, but perfecting an ATS that can support 208V loads above 5 kW has proven impossible – until now. Tripp Lite has developed a patent-pending high-capacity 3-phase rack transfer switch technology, used in rack ATS models that support loads up to 8.6, 12.5 or 17.3 kW. 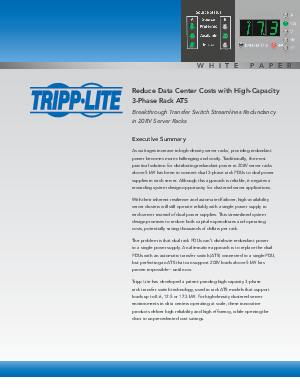 For high-density clustered server environments in data centers operating at scale, these innovative products deliver high reliability and high efficiency, while opening the door to unprecedented cost savings.